Rat’s Tail Radish is Fast & Prolific! Green or Purple?! I want to get you excited about another unusual heirloom veggie you might like to try! Rat’s Tail are indigenous to Southern portions of Asia. Seed ordering time is coming right up! These you need to order now for spring planting because they are heat lovers, though as a Brassica, they don’t mind SoCal winters either! It seeds in its first year, so you can save your own seeds for next year’s plantings right away! If you plan to save seeds, do not let ‘Rat’s Tail’ cross-pollinate, hybridize, with conventional radish varieties. You can imagine the problems, LOL! A very confused plant! Purple Dragon’s Tail is prolific too! You can see there is little foliage, a lot of pods! The pods are said to have the same ‘sizzling bite and crispness as traditional bulb radishes!’ In fact, all radish pods are edible, but these are bred specifically for their high flavor and to produce prodigious amounts of them! There are short Rat’s Tails; they also come in longs! Baker Creek Heirloom Seeds offers Singara Rat’s Tail Radish, a delicacy in India. They report the pods grew over 14 inches in length at their Missouri trial gardens this year! Perfect for beginner or market gardeners, very heat tolerant and an extremely generous producer. Rat’s Tails are an unruly plant! Leave plenty of room for their full personality to develop! Some say they definitely need some sort of support, but it looks to me like you can try and hope, but…. Full Sun. Planting is just like planting your regular radishes only you don’t harvest the little bulbs. You give it a lot of space! 1/2 to 1″ deep, thin to 18″ apart, and let it grow out to seed pods! You don’t just get one radish per plant, then replant, but you do have to wait. 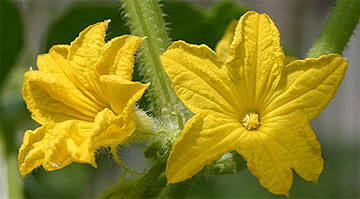 Once it starts podding, the harvest lasts about 4 to 6 weeks in the heat of summer. It grows up to 5′ tall and 2′ wide. Plant regular little bulb radishes for happiness supply before the Tails arrive! Rat’s Tails need regular water, at least 1 inch per week, especially while the pods are forming. In summer, mulch is good to keep the soil moist and cut back on weeds. Living mulch is a great choice! In winter remove mulch and let the soil get as warm as it can. A feeding 30 to 40 days in is good so they grow fast and full. If they don’t get enough water or food, the pods may be smaller, hotter, fibrous. Like other radishes, they are fast to produce! It’s a quick 45 – 50 days to harvest! Snap a pod in half to see how crisp it is. Plant every 2 – 3 weeks. Rat’s Tail pods form faster in heat and you’ll need to harvest young pods regularly or the plants will stop setting flowers. And, like okra, large pods get tough in a minute! If you need a less harvest time intensive plant this year, Rat’s Tail may not be the choice for you. Store only a couple days at most. Aphids may jump on your plant, but you know where the hose is! Blow ’em away! Or grab the insecticidal soap. Eat raw, that means right off the plant! Put them in Salads, stir-fries, stews. Eat pickled, with a dip! The flowers are pretty sprinkled on salads. Cooking knocks back the heat, but they are still crunchy. White, yellow, pink and purple flowers attract all sorts of butterflies and bees and the plants add lovely texture to your garden! Plant a patch among your ornamentals! JUNE! Harvest and Don’t Stop Planting! June is another grand month for planting, more heat, fast growth. Plant in spots that have already finished; plant for succession, a continued harvest of your favorites! If you couldn’t take advantage of April or May, step up to it now! Seeds are good, transplants are faster if your summer palate is salivating! Hotties like corn, cucs, beans, jicama, melons, okra, peppers, pumpkins, New Zealand spinach, all squashes! I’ve planted corn in August and got great October corn! Plant tasty year-rounds – beets, carrots, chard, cilantro, radish, turnips. Tomatoes with basils now and next month. More tomatoes if you will be dehydrating for camping, winter stews, snacks. Try something new –maybe something you can’t get at the store! Why are we discussing okra in June? Because it is time to plant okra seed for fall gardens. Depending on the variety, first pods are ready for harvest about 2 months after planting. If you plant in mid-June, you will not harvest until mid-August. If you wait until later, cool nights will decrease production. Of course, many gardeners have okra already growing that will continue to produce until frost. If these plants are too tall, they should now be cut back to a height of 4 feet so that re-branching and production will occur before cool weather arrives. If you are an okra lover, it’s double your pleasure because it is in the hibiscus/hollyhock family and makes breathtakingly lovely flowers! Okra is like little stars in a salad; you cut it in thin slices across the raw pod. Or cook it traditionally, steamed, in stew, jambalaya over rice, or deep fried. If you are driving through Mojave, there’s a restaurant on the main drag that fries it to perfection! Perhaps the most important thing to know is okra has to be harvested while small to medium, while tender. Otherwise, you end up with an unchewable tough monster. Big is not better, trust me. Biodiversity really works! Mix it up, spread out your plantings. Solid blocks (except for corn for pollination) of one plant or overplanting same kind plants in leaf touching rows are particularly susceptible to pest and disease spread, gopher loss. Lose one, lose ‘em all. To further confuse pests, pop in some herbs, basil with tomatoes, marigolds, as an understory in the between spaces! Grow arugula and lettuces in the shade of your mighty corn! Two on one trellis! 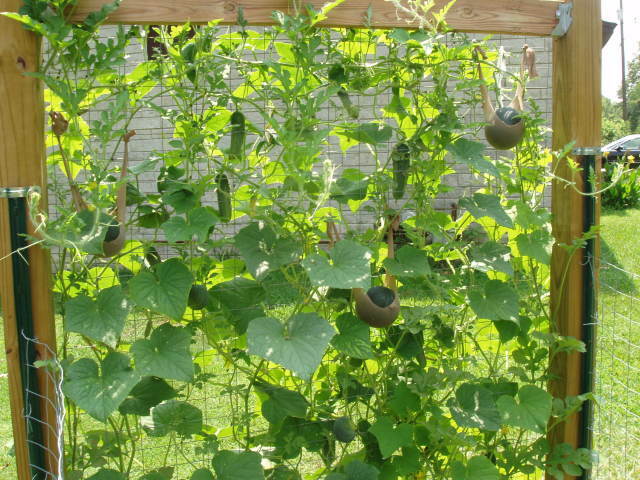 Check out the good size dark cucumbers hanging, and the ‘hammock’ supported melons!